What's new at SEA LIFE Birmingham?  What is SEA LIFE Birmingham? What is inside SEA LIFE Birmingham? What can you do at SEA LIFE Birmingham? How many areas are there within SEA LIFE Birmingham? What time are your talks and feeds at SEA LIFE Birmingham? What happens if I need to leave before the end of my visit? Can I eat and drink once inside SEA LIFE Birmingham? Am I allowed to take photos at SEA LIFE Birmingham? How long should we allow for our visit? Yes you can as we want you to take your memories home with you, however we do not permit the use of any flash photography as this can harm our creatures. The use of tripods is also not permitted and if you wish to use a tripod you will need to arrange this with our marketing team by contacting us using the Contact Us Form here.